Rejani, P., Radhakrishnan, A., Beena, B. (2014). Photo Catalytic Decomposition of Malachite Green in Aqueous Solutions under UV Irradition Using Nano ZnO Rod. Iranian Journal of Energy and Environment; previously called: Iranica Journal of Energy & Environment, 5(3), -. P. Rejani; Asha Radhakrishnan; B. Beena. "Photo Catalytic Decomposition of Malachite Green in Aqueous Solutions under UV Irradition Using Nano ZnO Rod". Iranian Journal of Energy and Environment; previously called: Iranica Journal of Energy & Environment, 5, 3, 2014, -. Rejani, P., Radhakrishnan, A., Beena, B. (2014). 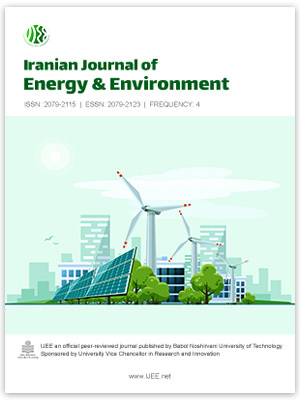 'Photo Catalytic Decomposition of Malachite Green in Aqueous Solutions under UV Irradition Using Nano ZnO Rod', Iranian Journal of Energy and Environment; previously called: Iranica Journal of Energy & Environment, 5(3), pp. -. Rejani, P., Radhakrishnan, A., Beena, B. Photo Catalytic Decomposition of Malachite Green in Aqueous Solutions under UV Irradition Using Nano ZnO Rod. Iranian Journal of Energy and Environment; previously called: Iranica Journal of Energy & Environment, 2014; 5(3): -.